can I animate an image to turn into another image e.g. a square into a circle? If I can would I do it by oversizing the circle in a square panel? @Zetos, looking at the default HudTournament.res file would've given the if_mvm + visible 0 you can use, and does it hurt to simply try? @Xen, you can fake it by using SetVisible 0 on the square when doing the SetVisible 1 on the circle? @Zetos, looking at the default HudTournament.res file would've given the [i]if_mvm[/i] + visible 0 you can use, and does it hurt to simply try? Apologies if this is a dumb question, but is it possible to rotate elements within a hud? For example I have a square, can I rotate it say 45 degrees for example? Or will I have to find workarounds? Wiethoofd@Zetos, looking at the default HudTournament.res file would've given the if_mvm + visible 0 you can use, and does it hurt to simply try? 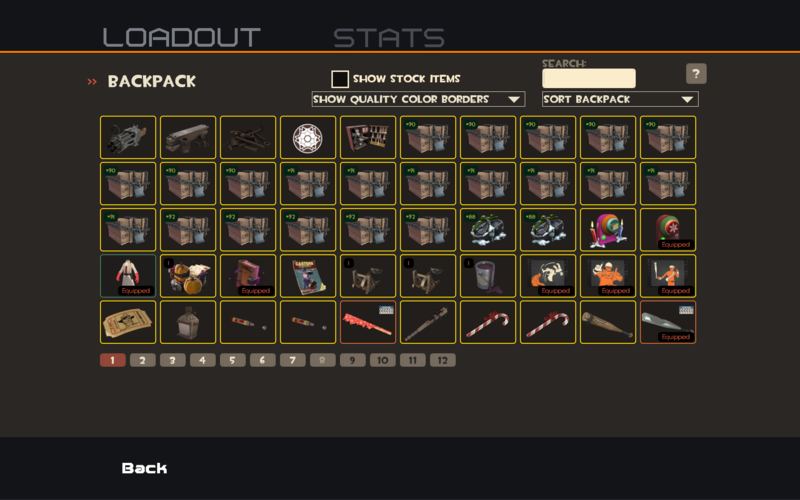 I've seen "if_mvm" being used, but I didn't know which file controled that HUD element to even look it up, or if that would do the trick, hence me asking. I found that "TournamentConditionLabel" already has if_mvm visible set to 0, but it is visible - as shown in the screenshot -, so I don't know which snippet to look for. Jackal176Apologies if this is a dumb question, but is it possible to rotate elements within a hud? For example I have a square, can I rotate it say 45 degrees for example? Or will I have to find workarounds? You can't rotate elements through hud files. If it's just a square though, you could make an image file that's a rotated square to your liking and use that. what's the command that prints console output on the top left of your game? hooliwhat's the command that prints console output on the top left of your game? is it possible to move the team coloured panel for the target id so it is a bar on the left without refracts? Does anyone know what the file for the medic's shield in Mann vs Machine is called? Jackal176Does anyone know what the file for the medic's shield in Mann vs Machine is called? It's HUDItemEffectMeter_Heavy.res, shared with the heavy's rage meter. Is it possible to turn the cow manglers reload bar into a number counter like normal Rocket launchers? Failw1zardIs it possible to turn the cow manglers reload bar into a number counter like normal Rocket launchers? how do it edit the thing that says view achievements? Zetos Jackal176Does anyone know what the file for the medic's shield in Mann vs Machine is called? It's HUDItemEffectMeter_Heavy.res, shared with the heavy's rage meter. can I do something like textinsety that is global so I don't have to realign every font in a text editor because I am a mac scrub? So, how do I edit the backpack? I figured out how to edit some parts of it but I can't figure out how to edit this (http://i.imgur.com/ytLBaK1.png) and the stats screen. Can anyone help me out? Jackal176So, how do I edit the backpack? I figured out how to edit some parts of it but I can't figure out how to edit this (http://i.imgur.com/ytLBaK1.png) and the stats screen. Can anyone help me out? How do I remove the patient health cross? TheFastFreakHow do I remove the patient health cross? look for bonusimage and move it off the screen/make it invisible/whatever you want to do with it. [quote=TheFastFreak]How do I remove the patient health cross? whats the name of the resource/ui folder file that I can edit these 2 fonts with? I want to take Cubekol's m0re hud edit (http://imgur.com/a/Lj8MH) and put it into Hypnotize's updated m0re hud, and also change the gay pink colors to a blue color (0 175 255 255). Is there an easy way to do this quickly? I was in the process of replacing the files and just changing the fgcolor, but I'm not sure which files he actually edited and which he didn't so that didn't really work out. First up, I USED updated Hypnotize's m0re hud, so you don't need to put it in there. It's very easy, just change "Main Menu Labels" in "Color Customization.res" and "CkMain" in "sourcescheme.res" to your color. Also, Hurt and Buff colors arent in "Color Customization.res", so you need to change it through "hudanimations_m0re.txt". Thanks for good intentions in changing this god awful color. First up, I [u]USED[/u] updated Hypnotize's m0re hud, so you don't need to put it in there. Thing is I already have edits of my own in the m0re hud I'm using, which was based on Hypnotize's lol. I guess moving them to your edit would make a lot more sense though, thanks. A bit off-topic, but I don't want to create another thread. I've tried installing (tf>custom>HUD) numerous huds but none of them work, the game just gives me the default. I assume that it just doesn't read the files for some reason but can't figure out why. Anyone has any ideas? Chill_ColinsA bit off-topic, but I don't want to create another thread. I've tried installing (tf>custom>HUD) numerous huds but none of them work, the game just gives me the default. I assume that it just doesn't read the files for some reason but can't figure out why. Anyone has any ideas? XenThePybro Chill_ColinsA bit off-topic, but I don't want to create another thread. I've tried installing (tf>custom>HUD) numerous huds but none of them work, the game just gives me the default. I assume that it just doesn't read the files for some reason but can't figure out why. Anyone has any ideas? Nope, the game doesn't even lauch and I get an error notification saying "Tried to add tf>custom>materials as a search path." You are missing the info.vdf file probably, you can take it from another hud, then just change the hud name inside the file.